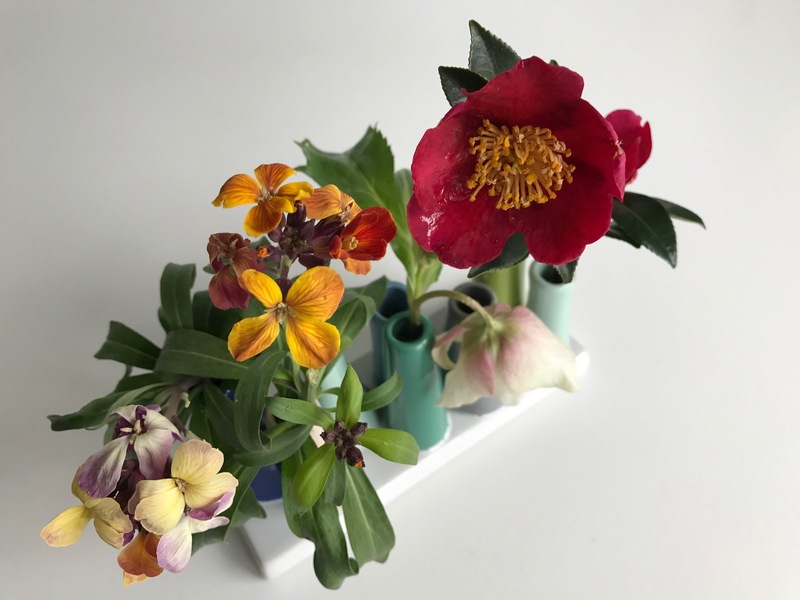 In A Vase On Monday is an opportunity hosted by Cathy at Rambling In The Garden to create and share an arrangement using materials gathered from one’s garden. A pair of Phalaenopsis orchids were on standby in the dining room for use in the final Monday vase of 2016, but before my sisters arrived Christmas Day (bringing dinner no less) I swept through the garden to see if I could cobble together a home-grown arrangement to end the year. 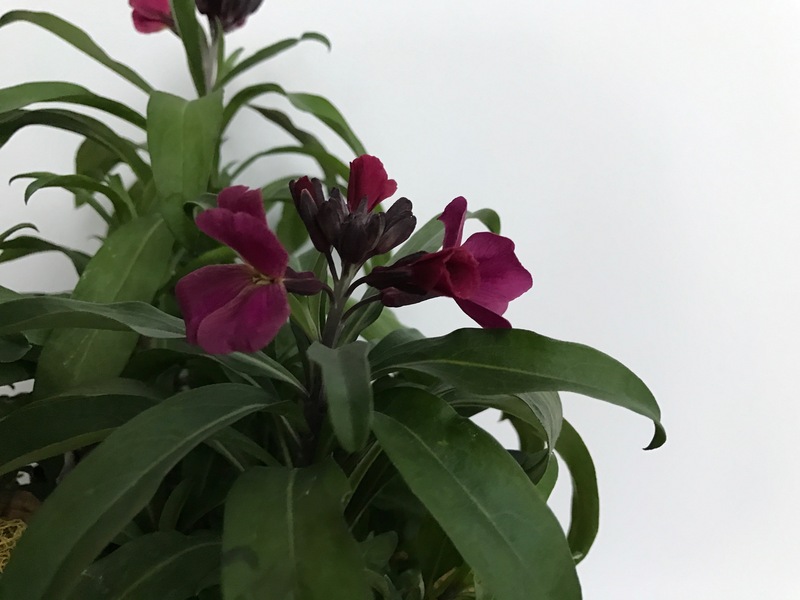 I have been keeping an eye on a half-dozen of the Sugar Rush series of Erysimum plants purchased several weeks ago. They are still unplanted but I hope to change that dubious status soon. As more of them bloomed the flowers have become decidedly multicolored. I am unsure if that is normal. It took a little courage to cut the stems but I finally decided they just might work in this week’s vase. Despite some cold nights Yuletide camellias are continuing to open. 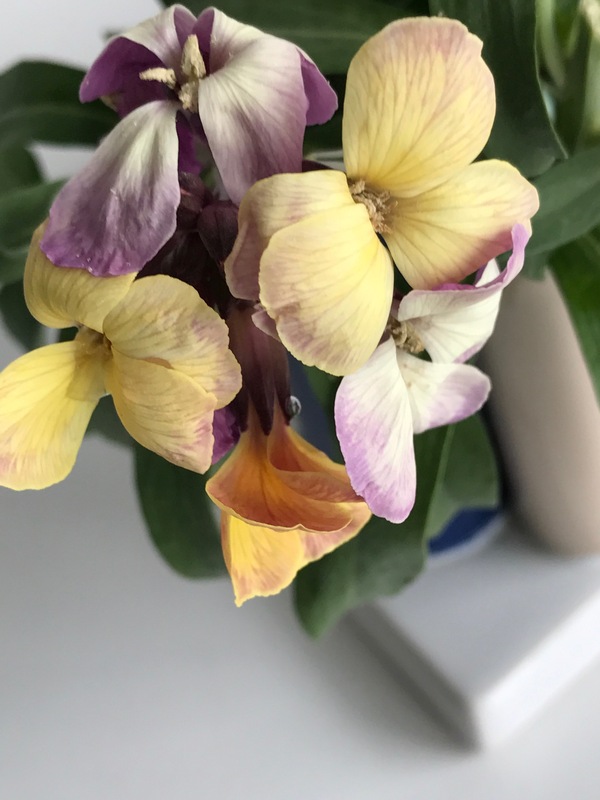 Although redundant, having relied heavily on this flower since Thanksgiving, I plucked several fresh blooms just in case. The golden center coordinated nicely with a gold Erysimum. Before heading indoors I checked on the Hellebores planted nearby. 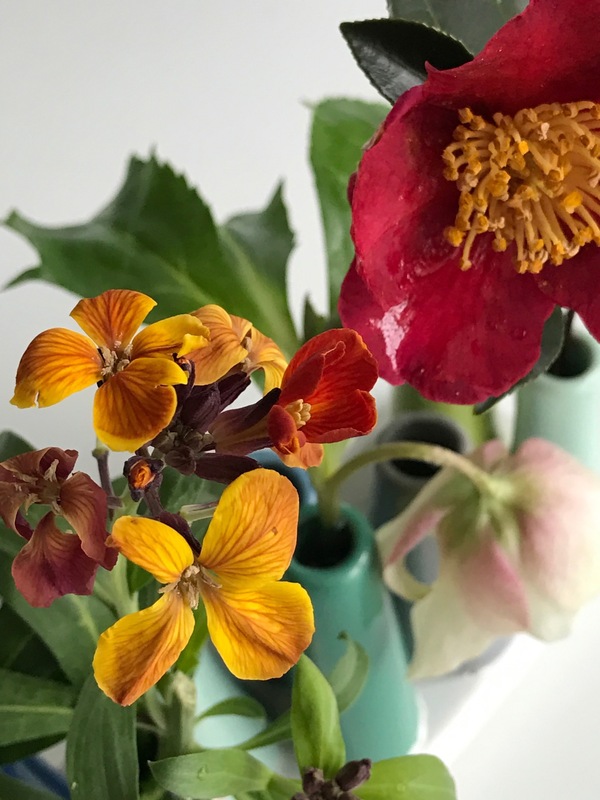 Excited to find a couple of nodding blooms, I selected one for today’s vase. 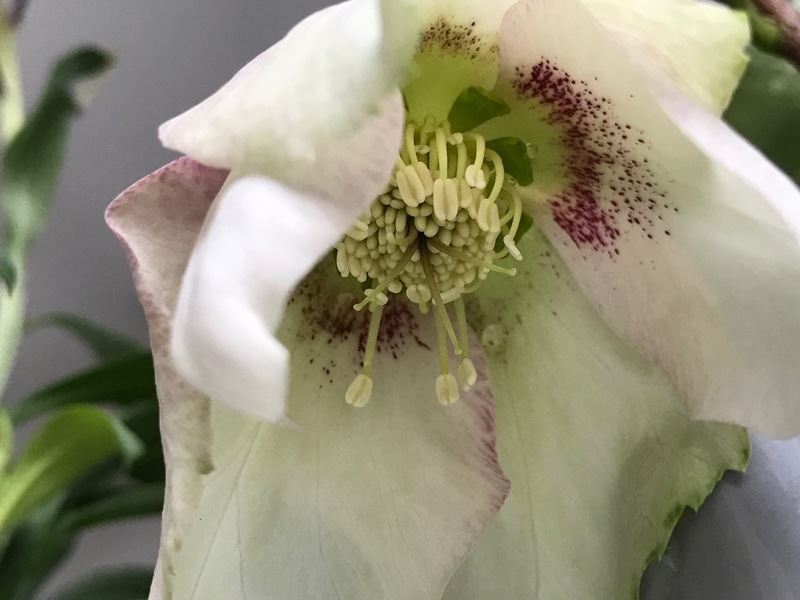 I think of Helleborus as starting a new cycle of flowers for the upcoming year. There was no time to labor over this arrangement. With the rush of expected company in mind I quickly filled a multi-stemmed vase and inserted the flowers. It is nice to finish up 2016 by sharing this little container of colorful flowers and thereby completing the 52nd vase of the year. Mondays have taken on new meaning since my initial participation in late January 2014 and I have become a little obsessed with finding something to place in a vase each week. During some parts of the year the garden offers enough bounty that the choice becomes what to omit rather than what to include. 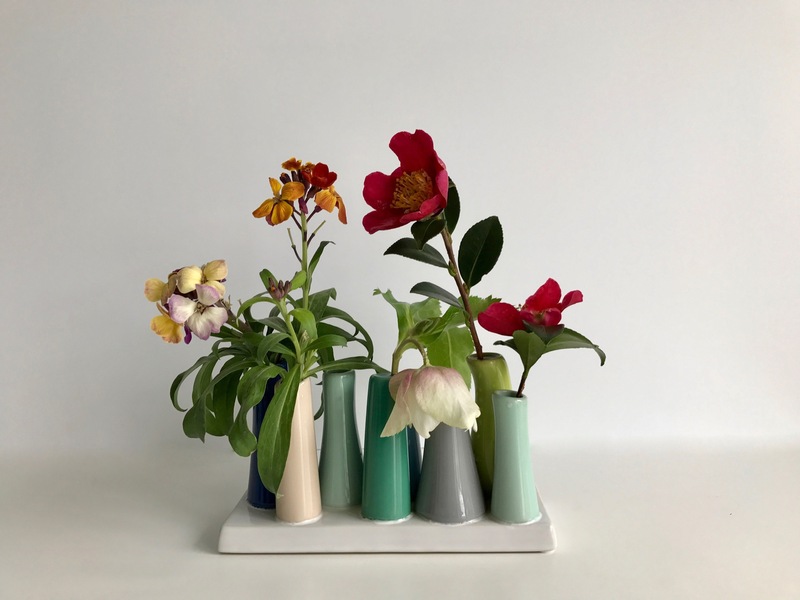 At other times like today when the garden is resting, fewer items stand out as obvious features for a vase, and the creative challenge is to treat like a star whatever is available. In either case, in times of abundance or scarcity, naturally some arrangements are more successful than others, but I find there is always something to learn. 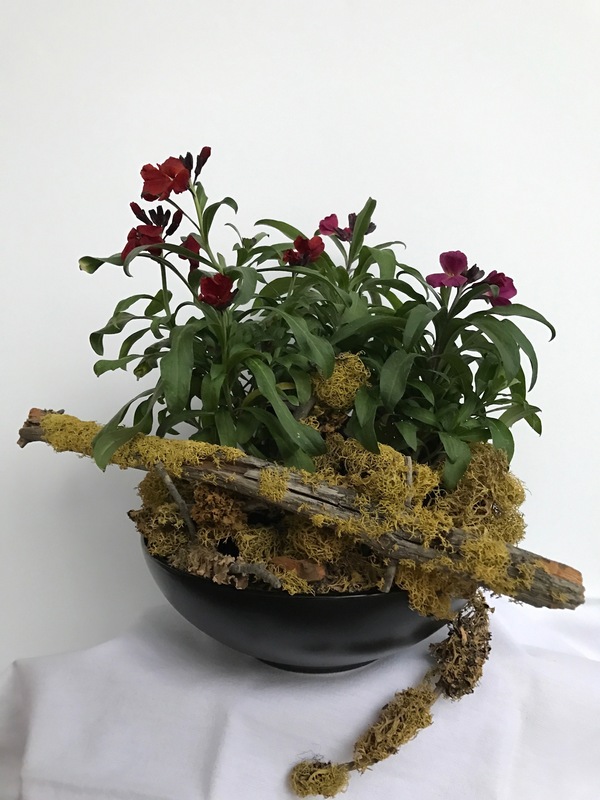 Besides it is just pure fun to imagine and experiment and play with flowers each week. 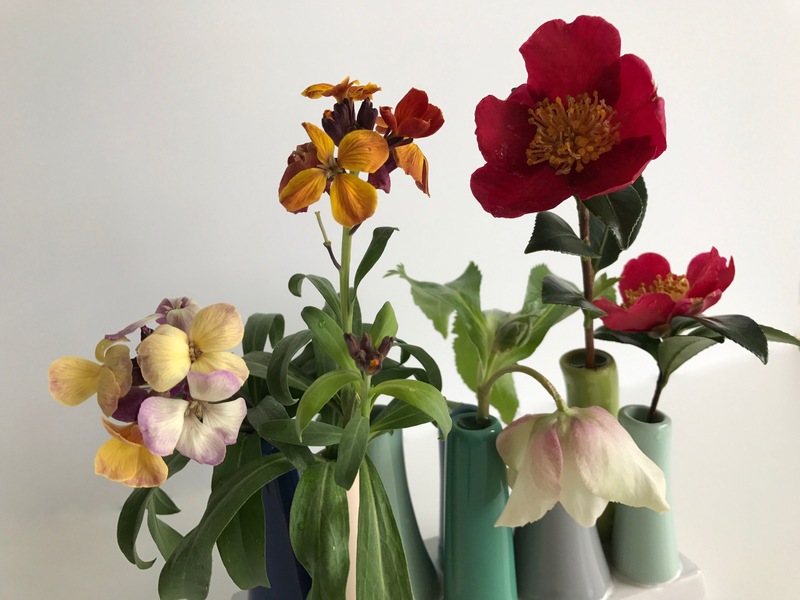 It is helpful to be able to look back at what was blooming in past years or at what vase I used to display certain flowers. As a resource last year I began creating annual galleries of my Monday floral designs with directories to link back to the original descriptions. Now at a glance I can view the entire year of vases by referring to these pages from the Floral Design menu. 2016 — 2015 — 2014. Another aspect to IAVOM is visiting as many other participants’ sites as possible each week to see what is blooming in other parts of the world. I always get ideas and insights from studying what other Monday vasers have created. And of course, I always appreciate reader comments–it is great to stay in touch. A special heartfelt thanks to Cathy for hosting and giving us a chance to express our flower arranging passion. Visit her at Rambling In The Garden to discover what she and others are placing In A Vase On Monday. 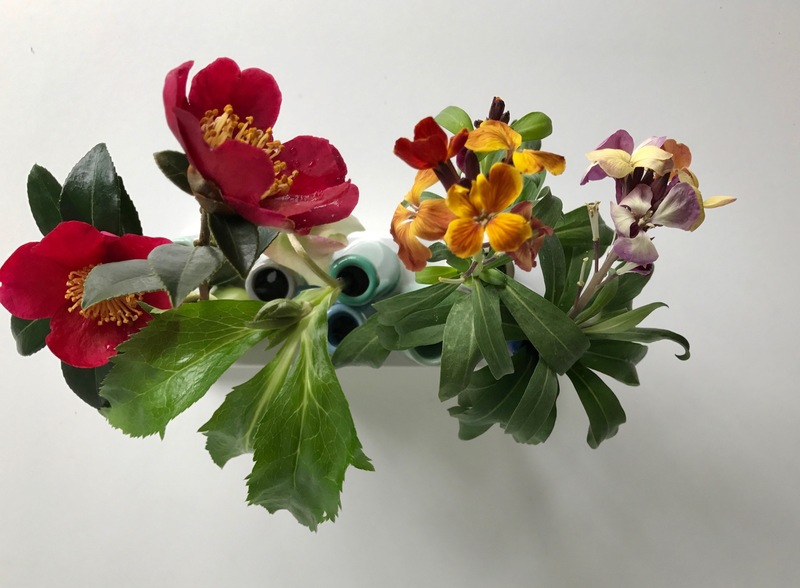 This entry was posted in garden and tagged Camellia sasanqua 'Yuletide', Erysimum 'Sugar Rush Red', flower arranging, flower design, Helleborus x hybridus (Lenten rose), in a vase on monday, nature photography on December 26, 2016 by pbmgarden. At my favorite local garden center I purchased some snapdragons at a marked down price last week, but a cold snap has kept me from getting them planted in the meditation circle. 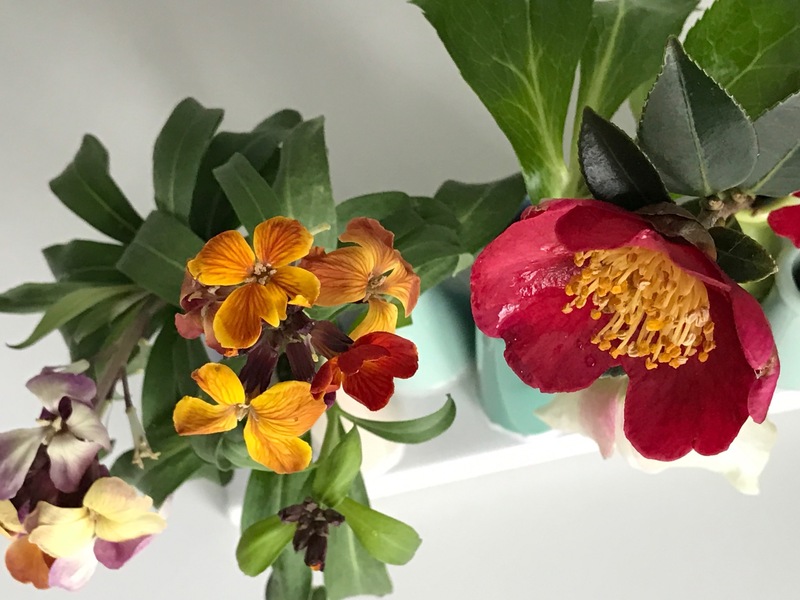 Also I picked up several wallflowers, a fall-blooming type that may not survive, but for now the plants are blooming in my garage where I placed them for protection (the temperatures fell to the low 20s F° this week). There also is a gold one, not included today, and a purple one which is. 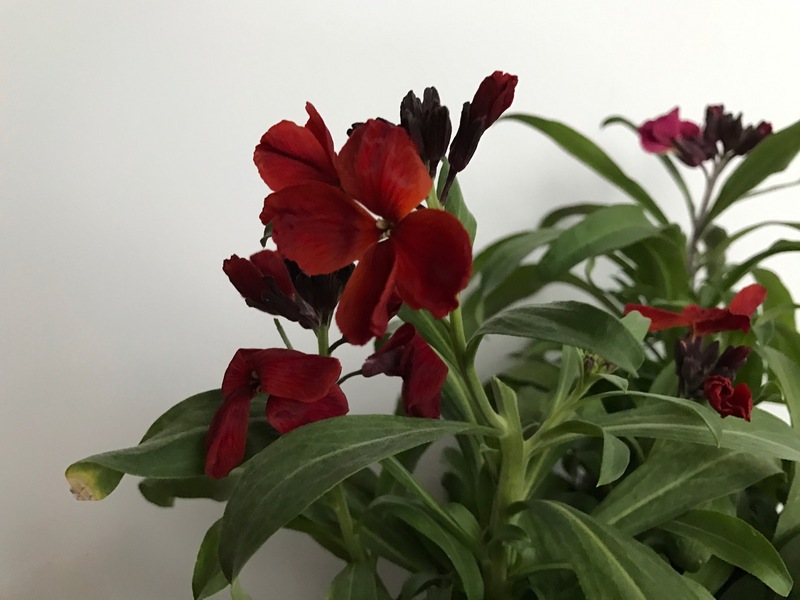 From what I read online Erysimum ‘Sugar Rush’ is specially bred so it can bloom in autumn without a preceding cold period and not just spring. These plants will probably be very confused as mild weather back into the 60s returns this week. Perhaps I can get them planted. Meanwhile they are useful for a Monday vase. 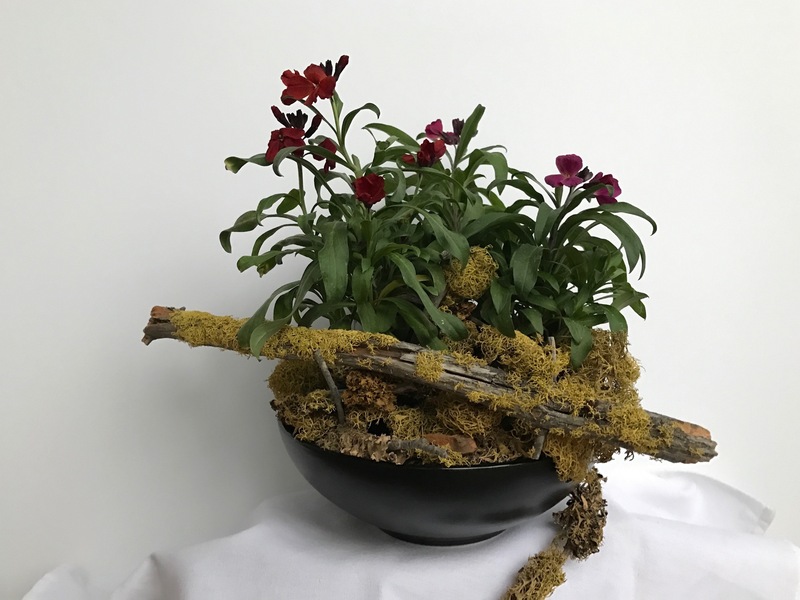 For today’s arrangement I placed 3 pots of Erysimum into a shallow ceramic bowl and tucked bits of lichen around the base of the plants. The lichen was a great find from the sharing table at last month’s garden club meeting. I never found out who brought it but when at the end of the meeting no one had claimed it, I could not resist taking it, along with some dried hydrangeas. I thought I would use some of the hydrangeas today but they were not needed after all. 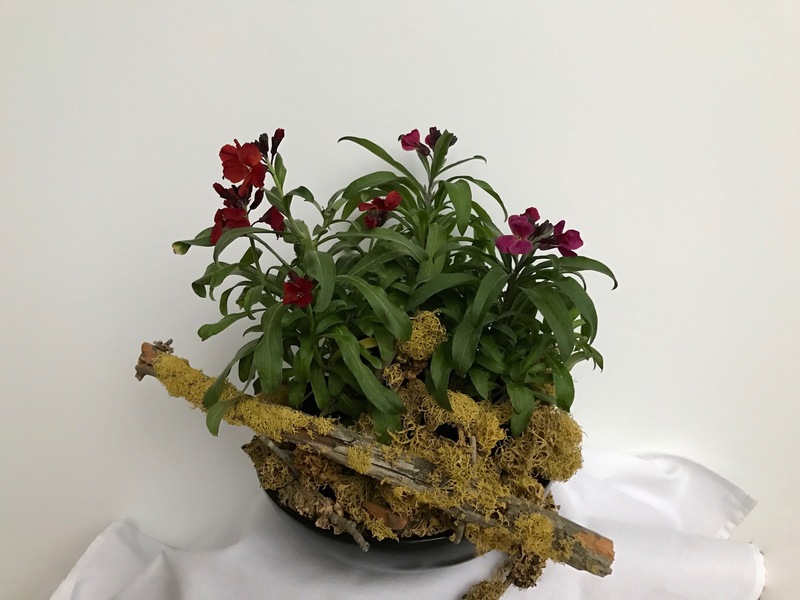 This entry was posted in garden and tagged Erysimum 'Sugar Rush Red', flower arranging, flower design, in a vase on monday, nature photography on December 12, 2016 by pbmgarden.